By creating a Google Alert, you can get notifications any time Google finds new results on a topic that interests you. You could get updates about a product you like, find out when people post something about you on the web, or keep up with news stories. 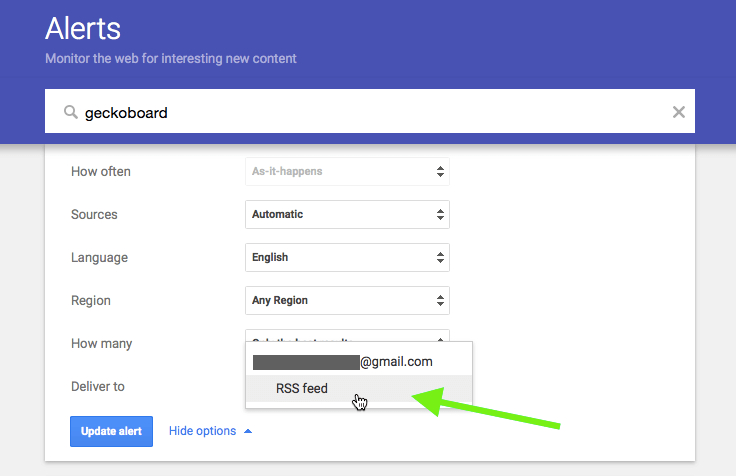 Create your Google Alert with the required configuration and set Deliver to to RSS Feed. For help creating your alerts, please refer to Google's guide here. Once the Alert is created, get its RSS feed URL using the  RSS icon. Add that URL to our RSS/Atom Feed widget. Want to learn more about configuring the RSS/Atom Feed widget, please check out this article.